1 Blemished Available: $98.96 This item is available as a Blem/Refurb. These are items that cannot be sold as "New" merchandise and are limited to stock on hand. See the product details for a description of the product's condition. The days of being an uncomfortable warrior are numbered. The bellowed panels fore and aft of the ankle enable an unrestricted range of motion while on the bike or afoot. Dual entry zippers allow the entire tongue to pivot forward making entry and exit a breeze. 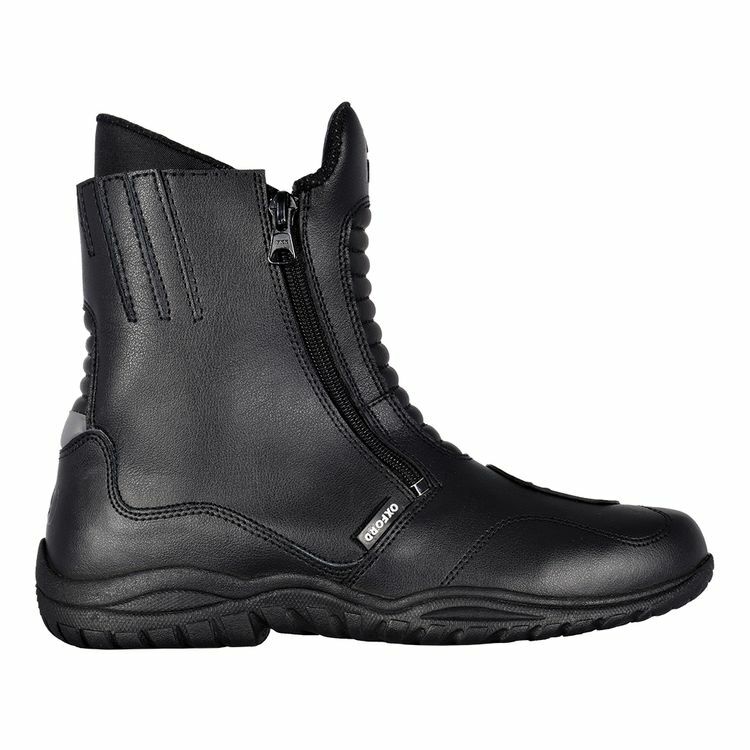 Integrated ankle protection and a reinforced shank keep you safe and secure. Upon ordering what I thought would have been the correct size (per a few comments). I found them to be a good size to small especially across the top of my feet. Returned them for the next size up, which has corrected the size issues. While wearing them on a few occasions the support or protection around the ankles are causing some irritation. I am hoping that breaking them in for a while will lessen the irritation. One other minor issue is the soles are pretty stiff, great for riding but a little too stiff for walking in. Hope this is helpful.. Upon ditching a similar branded boot on a recent 21 day NZ road ride, DF yesterday to severe leakage this boot came to the rescue providing style, price and durability. Whilst comfort was compromised due to age, once a day or two of full on use the leather relaxed to allow more ease with gear changes. Though not 100 percent waterproof, the boot remainef dry upto 30 minutes of constant drizzle. I would recommend this product for daily use, however if serious touring is your bag look elsewhere. I don't normally write reviews and I actually just got home from work (it's 1 AM); just tried on the boots. They feel great and fit true to size. They feel like they provide more protection than my A*'s track boots. I crashed last September with my A*'s boots and my foot got hurt pretty bad. These boots feel much more rigid (and comfortable, too). This is exactly what I have been looking for commuting (Central Valley, CA to the Bay Area). Have not ridden with them yet, but I will update this review after a month. And they don't make you look like a stormtrooper off the bike. Get maybe one european size larger than the sizing chart suggest. These boots feel great and are surprisingly unsweaty for a waterproofed boot. They feel safe enough for my kind of riding. I put my bike down on my ankle at low speed and that hurt. In these I think I would be fine. My one complaint is I would like to be able to remove the liners so they can dry faster if needed. They are glued in. We will see how long that glue lasts. What is the difference between this boot and the Bilt pro tourer boot? They have the exact same design. Are they the same shoe just re branded? Could we get a picture of the sole/tread?